California Republicans are gearing up to target several vulnerable Democratic state legislators in an effort to block Democratic governor Gavin Newsom's proposed new tax on drinking water. In his budget blueprint released two weeks into his tenure as governor, Newsom said he planned to create a "safe and affordable drinking water fund," to help poor communities clean up contaminated water systems. Supporters say the new tax would only cost each residential water customer 95 cents per month in an effort to raise $110 million a year for the fund. Opponents counter that improvements for water systems in specific communities around the state shouldn't require a new tax, especially when the state already has a $14.8 million budget surplus and has the highest state tax burden in the country. Even though California Democrats won big at the polls in November, passing a new water tax is not a slam dunk in the legislature because state law requires a two-thirds supermajority vote to impose a new tax law, and recent efforts to levy new taxes across the state for water initiatives have failed. Former governor Jerry Brown tried to push the water tax through the legislature last year, but the effort sparked protests from segments of the agricultural community and the Association of California Water Agencies (ACWA). The ACWA represents more than 400 water districts. Brown tried to turn the program into a voluntary tax, but that effort also failed. Democrats regained the super-majority in the legislature by stacking up big wins in November, making it easier to pass new taxes. Still, in that same election, California voters rejected an $8.9 billion proposed water bond expected to generate a $500 million fund for clean drinking water. 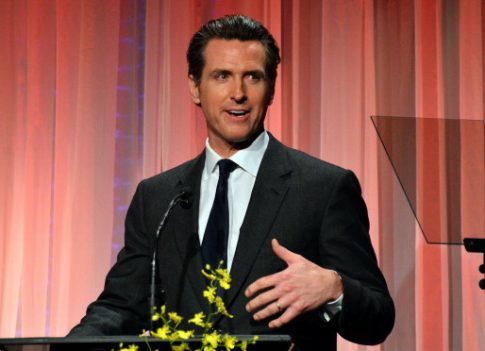 California Republicans and conservative activists are girding to battle a number of new tax hikes with Newsom at the helm and a Democratic super-majority in the state legislature. Already, they helped put a halt to a proposed tax on text messages in the state that angered Silicon Valley. They are also beginning to fight an expected Democratic effort to repeal the state's decades-old Proposition 13, which would dramatically increase property taxes. Carl DeMaio, a radio talk show host and the chairman of Reform America, a conservative group that unsuccessfully targeted the state's latest gas-tax hike last year, said the new water tax may appear as a modest new tax on consumers, but it's just one element of Newsom's multi-pronged plan to raise a number of taxes on California residents. "I warned you this was coming: Gov. Gavin Newsom has proposed a massive water tax! Yes, in addition to the cost of water charged on your utility bill, you will now be taxes for wanting to drink water," DeMaio told supporters in a recent email. "We must fight this—or more bizarre tax hikes will surely be added," he wrote. "The water tax is on top of the [texting] tax and gas-tax hikes. And Sacramento politicians are supporting a repeal of Prop 13 on the 2020 ballot to hike property taxes too." DeMaio said he plans to launch a campaign to stop the water tax by targeting several vulnerable state legislators in an effort to "bring maximum pressure to block this ridiculous tax." Newsom, during a budget press conference earlier this month, cited figures he said showed that roughly 1 million Californians don’t have access to safe drinking water. A McClatchy investigation in 2018 found that 360,000 Californians rely on water that does not meet state standards for toxins and that 6 million Californians get their drinking water from water companies that have violated state standards at least one time since 2012. "That is a disgrace," Newsom said at a budget press conference. He followed up with a visit to the Central Valley where he discussed the issue directly with residents who have experienced problems with their drinking water. "We met with resident who cannot drink or bath with the water in their homes—while paying more for it than those in Beverly Hills," Newsom tweeted Jan. 11th. ACWA Deputy Executive Cindy Tuck tried to clarify that only a small percentage of California residents do not have safe drinking water, something she agreed was an "unacceptable reality." "ACWA believes that making access to safe drinking water for all Californians should be a top priority for the state," she said in a statement. "However, a statewide water tax is highly problematic and is not necessary when alternative funding solutions exist and the state has a huge budget surplus." Tuck said she wants to work with Newsom, his administration and the legislature and other stakeholders on "finding a solution that does not impose a statewide water tax." The vast majority of Californians with unsafe drinking water are located in the Southern Joaquin Valley and Mojave Desert, the McClatchy investigation found. Jon Coupal of the Howard Jarvis Taxpayer Association also argues that any effort to address to improve drinking water for specific communities in California should draw on the state’s budget surplus. Coupal has called Newsom's proposal an example of "California’s knee-jerk reaction to default to a new tax whenever there's a problem." Steve Frank, a candidate for California Republican Party chairman, said Republicans in the state need to drive home the message that Democrats are continuously looking for new tax revenue streams. Even though the state's Republican party collected $34 million in the last election cycle, the most money raised by any single state party, Democrat or Republican, California Republicans still lacked any type of coherent message, Frank said. "There was none," he said. "If you don't have a message, you don't get the people to vote." Newsom's new flurry of new tax proposals should help spur Republicans into action if they are serious about regaining their footing and resurrecting their organization and focusing their messaging, he added. "Are you aware that Gavin Newsom wants to tax you on your water?" Frank asked in a recent interview with the Ventura County Reporter. "That's just one example of the overreach of the Democrat party, and that the Republican party needs to point out to folks. Every time they see a bottle of water, they should be seeing a Democrat and a tax, and that’s our responsibility." This entry was posted in Politics and tagged California, Gavin Newsom, Taxes. Bookmark the permalink.